I love these kind of pics. Beautifully done. You're not getting too blue there are you? I feel the sense of 'blue' or is it just me? I love how you connected the sunsets to the t-shirt—or vice-versa! I love your photos. They make me miss London. i am always a sucker for a beautiful sunset photo. absolutely beautiful! did you take these all? 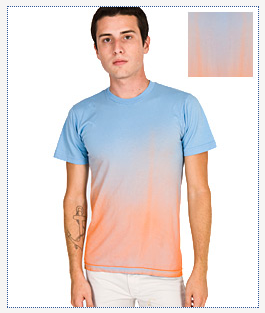 I'll take your sunset over the washed out LA sunset that's 'influenced' AA's ombre tee.